Breeding Crickets can be profitable so why not Turn an Expense into Income!! Breeding Crickets can be a great way to save thousands of dollars or make extra income. At WildlifeHub we have been producing feeder insects to pet stores, wildlife parks and the general public for over 11 years …. and we are happy to pass on our commercial tips to you. 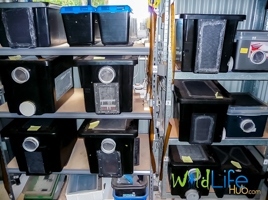 We will show you how an average two child family can produce around $1,400 worth of crickets just using their scrap veggies…and adding more containers for large scale production is easy!! Below we discuss how to avoid the pit traps of commercial production, and let you know how many crickets you can breed from home. There are numerous reptile owners, wildlife rescue carers, zoos and pet stores, constantly looking for a cheap and fresh supply of live foods. Why not tap into this market and sell crickets for profit? When we started, there was next to no information available. Not surprisingly, many commercial breeders were not willing to pass on this information, as they wanted you to keep buying insects from them. At WildlifeHub we are very different…we breed feeder insects to make money to help with mammal research, wildlife rescue and reptile keeping. We want to help conservation and wildlife enthusiasts like you to become independent breeders of live foods. If you want tips and information on how to Breed Insects for profit visit our Commercial page here. How Many Crickets Can I Produce from Home? To learn how many crickets you can produce using new low maintenance methods visit our “How Many Crickets Can I Produce” page. For instance maggots from vinegar flies rapidly spread and consumed all the eggs from the incubation chambers. Vinegar flies and other pests (ants, fungi, disease, spiders etc.) can completely devastate a breeding colony. Without the right information and strategies these species are impossible to control. It took us a long time to get our head around these pests which we now controlled using a combination of physical barriers, insect traps and active management. The other main reason people give up breeding crickets is it can take a lot of time and effort to clean, feed and manage a colony using conventional methods. At Wildlife Hub, we learnt early that we would need to develop new and more efficient methods if we were going to continue with our research, wildlife rescue and reptile keeping. As a result of these difficulties we spent over a decade streamlining both commercial and private methods. We did this by creating automated food and water dispensers, efficient container design and streamlined cleaning. Other areas we have overhauled include: pest management, how to grade crickets to various sizes, dispatching, transport and marketing tips and advice. 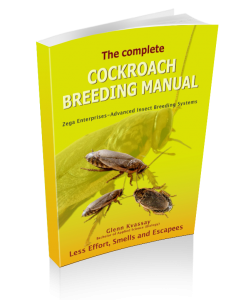 REVOLUTIONARY NEW CRICKET AND COCKROACH BREEDING SYSTEMS…Welcome to your one-stop shop for all the information you need to become self-sufficient in live foods.